MILV are a Russian brand who make nail art water decals, sometimes referred to as sliders. I have purchased a huge stack of them so I figured it is a good time to review them as they go well with the Powder Perfect Bermuda Trio that I just reviewed. I buy mine from either Powder Perfect or What’s Up Nails (where I get my nail vinyls from). They come in opaque designs that you put over a white base as well as designs with transparent parts that you can layer over any colour – there will be a note on the packaging if the decal needs a white base. They are very simple to use, you just cut the size you want, place in room temperature water for a few seconds, then the white backing easily slides off so that you can place the decal on your nail. Once in place, smooth out all the creases that you can see and let the decal dry. Once it is dry, you can then file off any extra decal hanging over the free edge and use acetone to clean up excess around the cuticle area. I have previously used nail scissors to remove any excess decal from around the cuticle area, but I find acetone and a little clean up brush to be much easier to use. 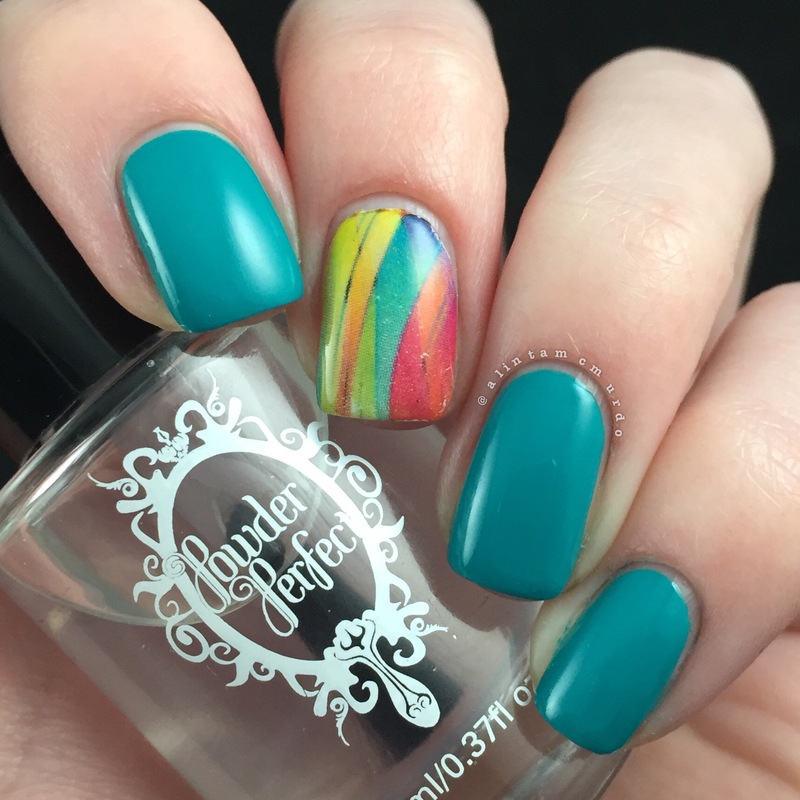 The first combination I used was MILV N 392 water decal with Powder Perfect Bermuda, a lovely teal polish. N392 is an opaque design so the packaging said to use a white base underneath, so I used one coat of Pretty Serious Presence before I applied the decal. 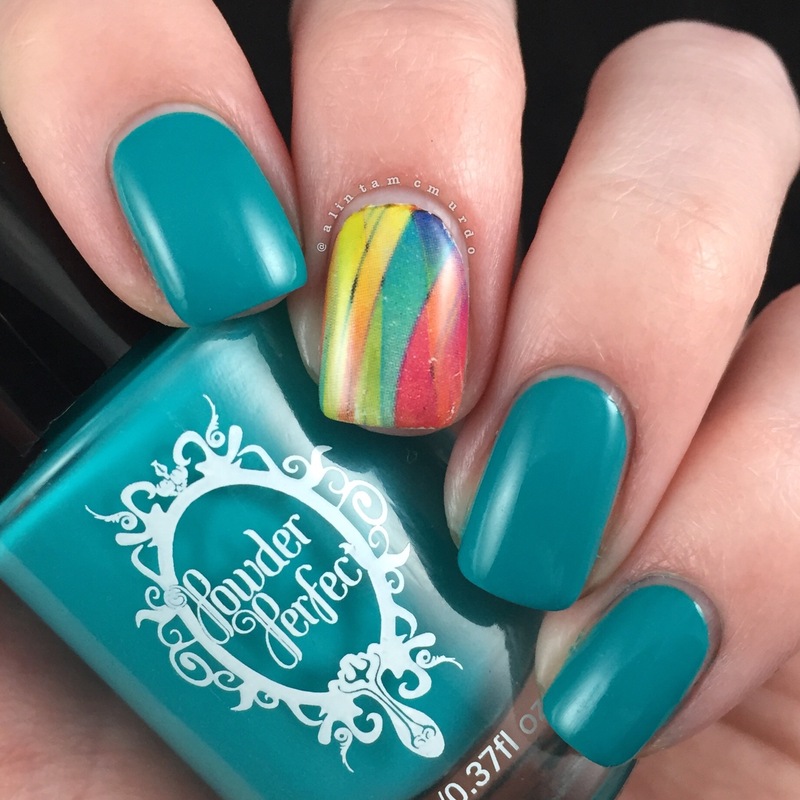 This set of decals has one end that is curved and one end that is straight so it makes it a lot easier to line up to the cuticle and not have a whole lot of excess to clean up. All the decals on the N392 sheet have the same wavy pattern, they just differ with where the red and green colourings are placed. 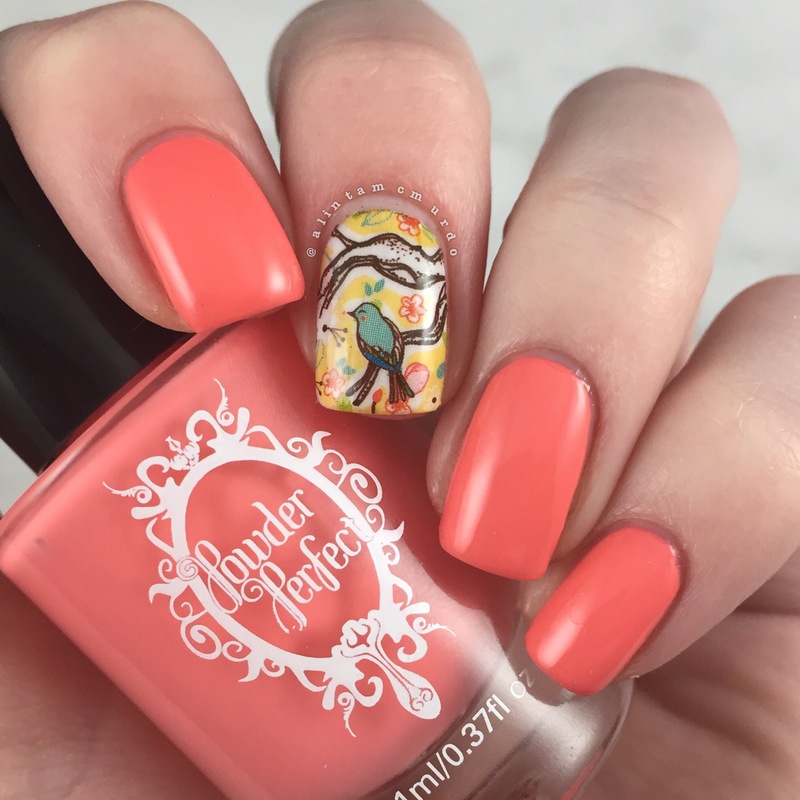 Then I used a combination of MILV N 265 water decal and Powder Perfect Florida, a gorgeous coral. The packaging of N265 said to use a white base, so again I used Pretty Serious Absence, but I noticed that once off the white backing, there are a few transparent parts to the design that came through as white when on the nail. The light base is obviously needed to keep the colours bright, but I actually think I would have preferred the look of this decal over a cream base so that the transparent/white areas didn’t stand out as much as they do. I still love this design, even with the white areas. 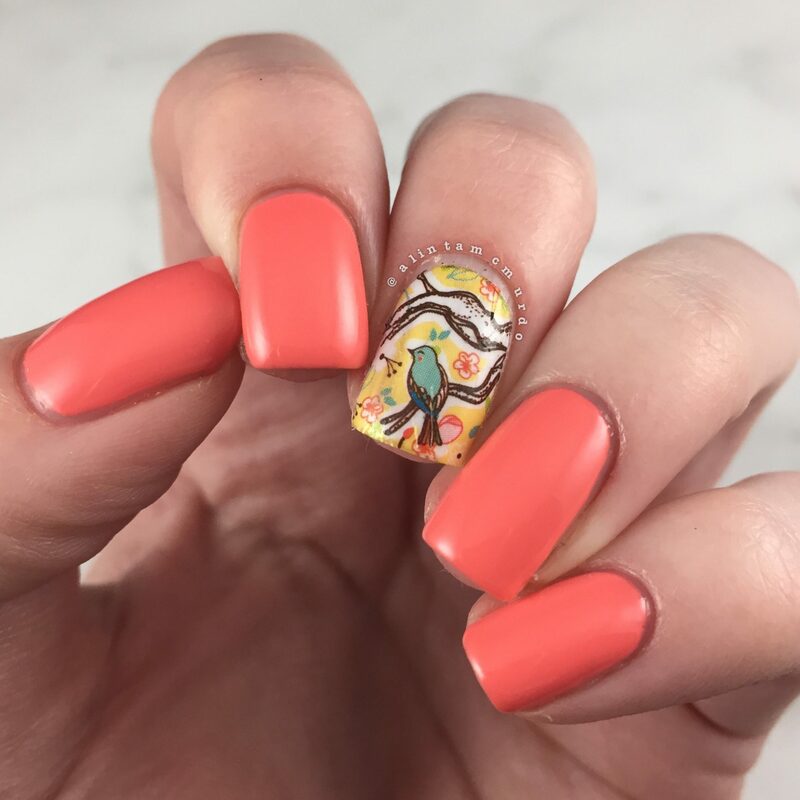 This decal is designed with a curve on both ends and each separate decal has at least one bird on it so you know which way to place it on the nail. The decal you see on my nail is actually the second one I used as the first one was smeared by the top coat I put over it. 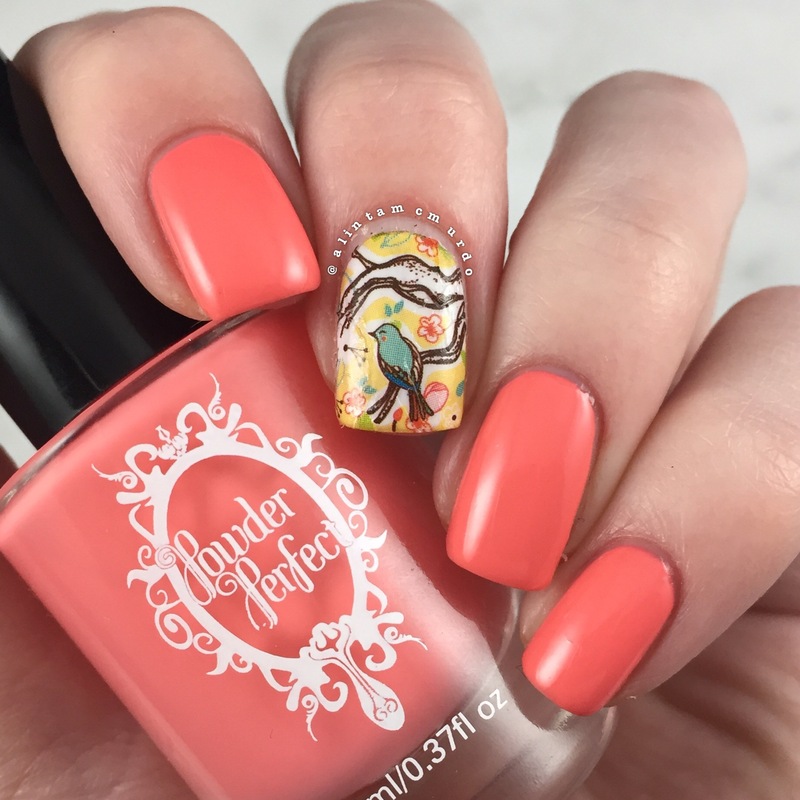 The first decal had many more of the pink/coral flowers on it but I wasn’t able to fit all the flowers and the bird on my nail with this decal, as width of it was quite a bit bigger. Finally, I used a combination of MILV N 225p decal with Powder Perfect Puerto Rico, a true purple. I’m not sure why this decal has a red p at the end of it’s name and it isn’t just N225 like all the other decals. 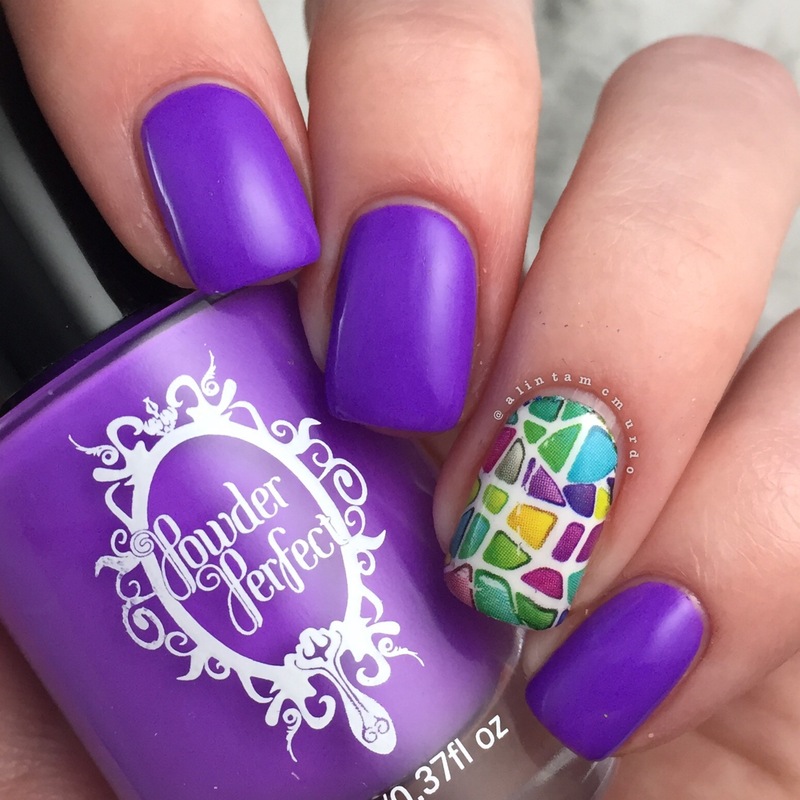 This set of decals is separated into rectangular sections, so you need to cut a curved area for your cuticle, but the straight edges will make them easier to use in nail art designs. N255p doesn’t have the “white base only” text that the other two decal sets had, so you could use this with any base colour. I went with white again as I thought the colours would pop most against that. You can see that that there is a little wrinkle in this decal as I didn’t spend as much time smoothing it out as I did with the others. Overall, I really like using the MILV water decals as they easy to use and much better quality than some of the decals I have purchased from ebay previously. One thing that I do struggle with is the sizes of the of the decals as they are far too big for my nails. The biggest design on each sheet is twice the size of my thumb nail so any decal with an image that needs to be seen in it’s entirety won’t work for me. The good thing is that MILV make a lot of decals that can just have one part of them used and still look great. I really like a lot of the abstract designs like N225 and N392. I have always had problem with decals and top coat. Some decals from ebay smear with every top coat and every technique I have tried. The MILV decals however were much better. I only had one decal smear and even then, it wasn’t anywhere near as bad as others I have tried. People have always told me to use a very thick layer of top coat over decals so that you don’t touch the ink when swiping over it, but it was when I used a thick layer of Powder Perfect Lightning Lady Top Coat that it smeared. A thinner layer of the same topcoat worked much better on all the other decals. The decals lasted as long as my top coat did, so use the longest wearing top coat you have when using them. I sometimes have problems with filing off the free edge as the base colour can then be seen at the tip of the nail. 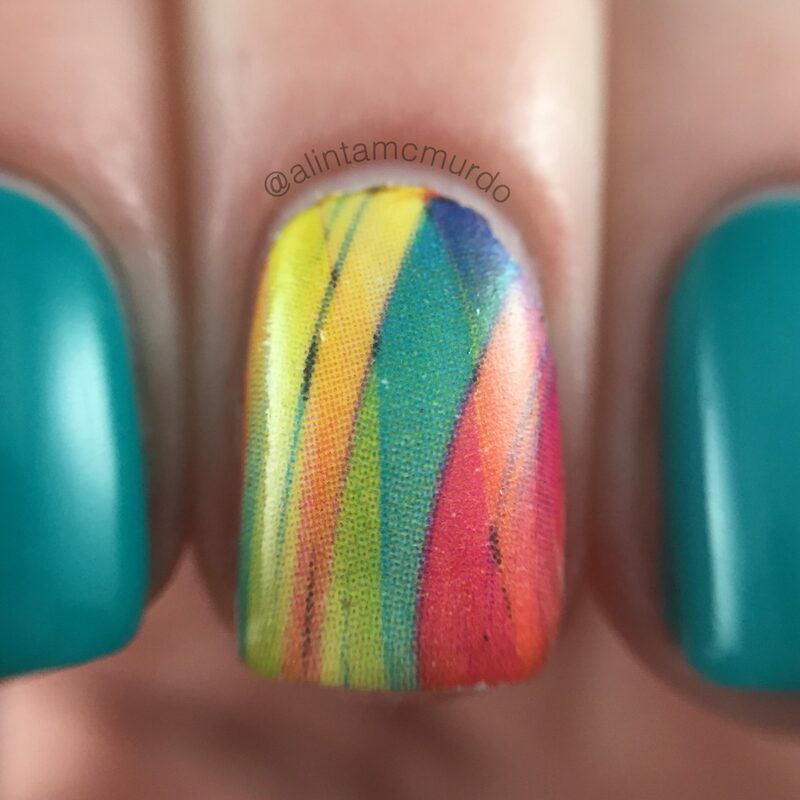 You can only see it in close up nail photos though, so it doesn’t have any affect on wearing the mani. I just make sure to coat my tips with top coat to seal the decal in well. As I said earlier, I buy my decals from either Powder Perfect or What’s Up Nails, whichever shop has the designs I want in stock. I really like the MILV decals for both the quality and ease of use. I will be using the ones I have and be buying more, as they’re an easy way to add something extra to a plain mani. I have a discount code with Powder Perfect that will work at both the Australian and International stores. Just use the code ALINTA at checkout to get 10% off your entire order – but it ends at the end of July, so stock up before then (this isn’t an affiliate code, just a discount code you can use). 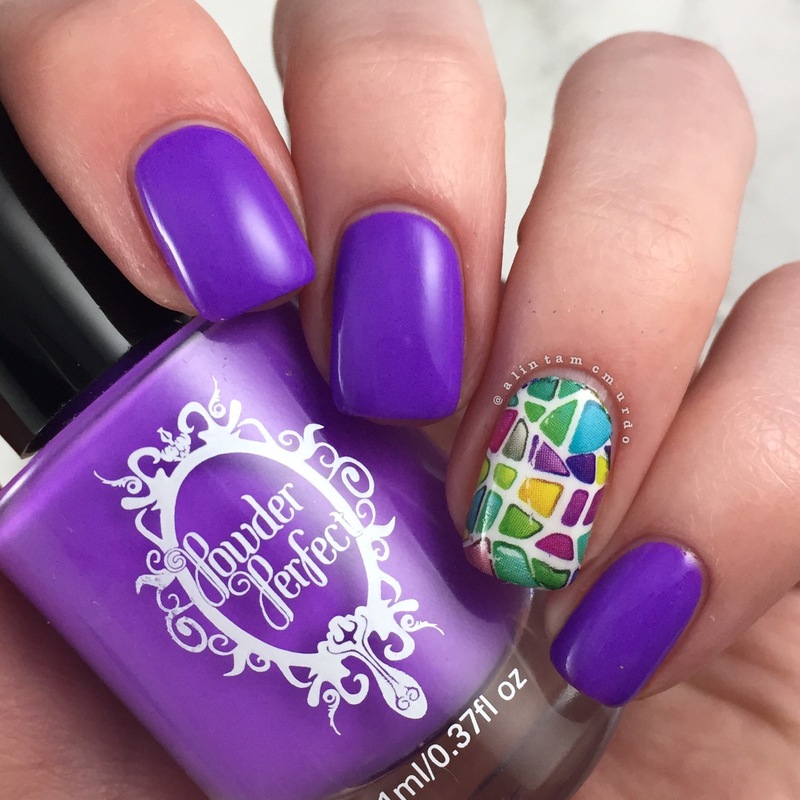 Have you tried the MILV water decals or do you have another brand that make good quality nail art water decals? The way you’ve paired these with the trio is so pretty!